Bruker’s Nanomechanics Lab is a new package with AFM modes for nanoscale characterisation of a wide range of materials, including hydrogels, metals and ceramics. 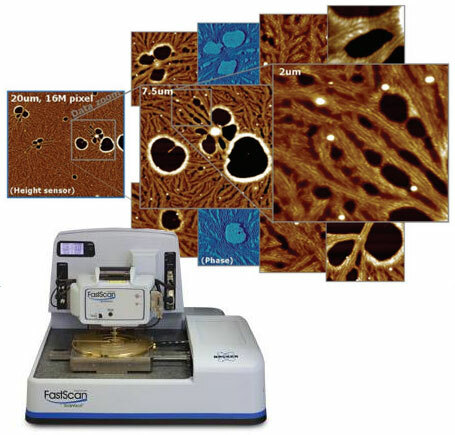 The package is compatible with the Bruker Dimension Icon and Dimension FastScan AFM systems. Blue Scientific is the official Nordic distributor for Bruker AFM in Norway, Sweden, Denmark, Finland and Iceland. For more information or quotes, please get in touch. Bruker’s NanoMechanics Lab is a new package for quantifiable nanoscale characterisation. The package is comprehensive, combining multiple techniques for a wide range of materials. 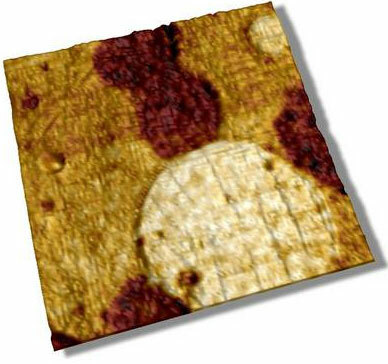 Acquire accurate and reliable AFM mechanical property data about all kinds of challenging materials, including soft hydrogels, stiff metals and ceramics. Access a full range of advanced modes with precise force and frequency control for complete nanomechanics materials research, from sub-nanometer resolution investigation to high volume AFM measurement and data analysis. Nanomechanics Lab is compatible with Bruker Dimension Icon and Dimension FastScan AFM systems. These modes can be combined to create huge data cubes, rendering a full array of elastic and viscoelastic data with high precision and repeatability, from just a single AFM system. With a new, improved version of PeakForce QNM, you can quantitatively characterise nanomechanical properties including modulus, adhesion, dissipation and deformation – while simultaneously imaging sample topography at atomic scale resolution. The method is non-destructive to both tip and sample; the peak normal force is controlled and lateral force on the probe is kept to a minimum. Perform routine quantifiable mechanical studies of materials in the 1 kPa to 100 GPa range. Bruker’s new vibrometry calibrated AFM probes have a precise tip shape for greater accuracy and consistently repeatable modulus measurements. 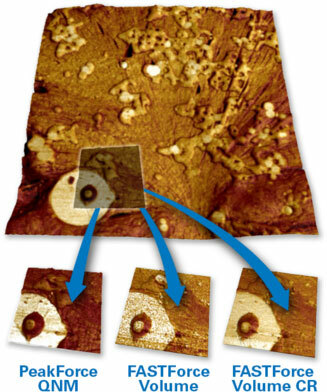 Used with PeakForce QNM, you can take routine measurements with much greater certainty, and render your results with high-resolution nanoscale mapping. PeakForce QNM data correlation with DMA for a 3 component polymer blend. FASTForce Volume accelerates the acquisition time of Force Mapping by >20x. Measure the mechanical properties of materials in the range of 1 kPa to 100 GPa. Linear ramps can be applied with frequencies to 400 Hz, to overlap with QNM for nanomechanical correlative studies between modes. This gives you greater measurement confidence and enables analysis of the frequency dependency of mechanical properties. Use AC force mapping to capture the complete force distance curve and sweep the whole frequency spectrum at every image pixel. This improves modelling, for repeatable and traceable results. Capture more than 15 different mechanical data channels including adhesion and stiffness, with real time displays of mechanical property values. Contact resonance has previously been hampered by slow imaging speed, complex analysis and the need for specialised hardware for full spectrum acquisition. FASTForce Volume CR overcomes these limitations by combining resonant and non-resonant modes to obtain the most accurate mechanical data, together with flexible, easy-to-use software. In contrast to other imaging-based contact resonance methods that are essentially contact mode, FASTForce Volume CR minimises lateral forces on the tip to reduce sample damage, tip wear and to gather many measurements from one probe. Stress and Strain Relaxation can be quantified at every image pixel with new Ramp Scripting software. Frequency swept as a function of contact force to study frequency depend stiffness and viscoelastic response. FastForce Volume – Simultaneous electrical modes (PFM, MFM etc) to generate datasets of information that was previously unobtainable. If you have any questions or if you’d like a demonstration or quote for Nanomechanics Lab for a new or existing AFM, please get in touch. Blue Scientific is the official distributor of Bruker AFM in the Nordic region, and we’re available regionally to help with any queries you have.